This is the Information Age, and that epicenter is information flow and content control. This is the one occupation that is best suited to benefit from this still evolving epoch of human history. In fact, any organization that fundamentally relies on information dissemination as a core resource to their production would seek out information experts as the de facto experts in this field for consultation on how best to handle their large volumes of information. Today, companies are searching for these very professionals and will pay extraordinarily well to have such expertise in their organizations. As long as they change their mindset, evolve from conservative ideologies of what a library professional is, and retain and improve upon the traditional library services while seeking to develop techniques and technologies that effectively handle the workflow of the information dissemination process in a Digital Age—adapting technologies such as the KATIE Index, the MEL System, and the LISA Informationbase for the physical and virtual collection management requirements—most library professionals will be able to focus on becoming information experts and establish their relevance at the very epicenter of business and education. Evolving into the information expert and leveraging new information technologies is where the future of library studies lays in this digital segment of the Information Age. This chapter concludes the first section of the book. In this age of information and diverse digital technologies, integration of computers and online information portals, typically accessed through Web browsers and small apps, and most recently within the last few years by interface-specific apps on smart phones and ultra-portable tablet and netbook computers, have become major elements forming the means in how users access information throughout their day. It used to be a few decades ago that our main source of information came through printed text, radio, television, and telephone—and even the latter three were life-changing innovations of their time. A generation prior, technologies such as the telephone, radio, and television were novelties and significant technological advancements within the home; common but still cutting edge. Though these technological transitions have also affected libraries, their collections, and how they provide services, most institutions still lag far behind in leveraging the extent of what integration of today's information technology can do for them and their patrons. Because of this lag, patrons are starting to associate with the library institution, whether public or private, a certain antiquarian and quaintness with its role in the community. The handful of diehard patrons are becoming fewer and fewer with each passing generation, and this is not because the library is becoming less relevant in today's increasingly technological lifestyles. It is exactly the opposite, as the mass of accessible information increases to the common person, the library and its services becomes ever more relevant in their life, but this loss of perceived relevance is due to the awkward and amateurish assimilation of common technologies in the user environment that their patrons use on a colloquial basis every day. Library staffs are reluctant to use these technologies, often times thrust upon them by out-of-touch library administrators, and train patrons to use them because the adaptations are done so poorly, and usually deployed without their feedback. This need not be the case as there are successful case studies within the field, both public and private institutions, as to how some institutions have overcome this lethargy. 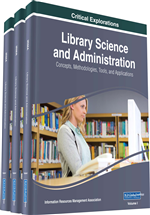 These successful adaptations are in addition to the traditional features that will continue to be the mainstay of the library, such as the information services, educational role, and access to classical and reliable forms of information and content. Some of the greatest successes have been in the information-based corporate world leveraging common, and in some cases even new, information technology in providing easier access to their products and marketing its use ever since board access to the Internet was made affordable to the public. One of the first informational institutions to take full advantage of the new revolutions in information access via networks and digital technology were the subscription database companies such as JSTOR, LexisNexis, Elsevier, and others of their business kind. Other companies I would include to this list are all the search engines services such as Google, Yahoo, and consumer information collection agencies—all of them dependent on developing IT infrastructure that can collect, collate, and provide access to huge amounts of information generated daily. For-profit businesses and highly business orientated not-for-profits collectively saw that the then relatively new Internet technologies, following the trends blazed by the Dot com companies of the 1990's, opened up considerable potential for deeper market penetration via online access of their products and services—a penetration that could only grow deeper as more people brought Internet access and services into their homes. A handful of library institutions that recognized this trend, such as the WorldCat consortium, remain fairly innovative even today, especially for not-for-profit, public-based organizations; though perhaps these are the exception, they are cases we can all learn from.